It’s that time of the New Year again, when resolutions are made and broken. But alongside the usual plans to lose weight, get organized or learn to dance, it’s not a bad idea to put some of that resolve into managing your investments. 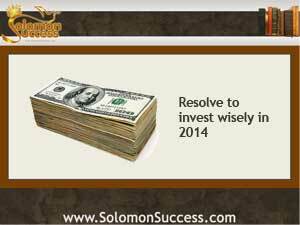 Inspired by King Solomon’s advice from the Book of Proverbs to act with wisdom and prudence, and Jason Hartman’s 10 Commandments of Real Estate Investing, here are 5 resolutions to make 2014 a prosperous investing year. Get investing secrets from the pros with Jason Hartman’s Meet the Masters of Investing Event in Irvine, CA January 18-19, 2014. Learn more here.